This is a perfect meal to throw together during the middle of the week. Quick, easy, and so delicious! We make this a lot! I like it sweet, so I add in brown sugar/honey/molasses or whatever, and top with purple onion (the only way I like purple onions!). Yours looks great! I love the deepness of this pizza. I am definitely saving this recipe. When I make it my husband will worship me! 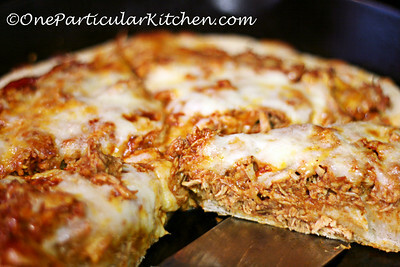 I love BBQ chicken pizza! That pizza looks seriously incredible! Dough isn’t so scary once you jump in there is it? 🙂 The cast iron skillet absolutely isn’t necessary. I always use one for pizza making because the finish of the cast iron makes the crust have a great crispy outside/chewy inside texture, and because the pores in cast iron mean you don’t end up with a soggy crust. You can absolutely do it with whatever you have on hand, though! If you make it on something non-porous (like a glass pizza plate or something) you’ll want to move it to a rack after it’s all cooked to avoid soggy crust. I was just wondering exactly what to do with the chicken in the morning. Will you make it a little more clear please because this looks sooo good! But I dont want to mess up the chicken part! So in the morning I put chicken in the crockpot right? For how long and on what temp setting? Thanks! Sorry for the trouble! Ooh I hope I catch you in time! 🙂 Yep, in the morning put the chicken in the crockpot on low; I let mine cook just about all day. Either check it when you get home from work, or check after six hours or so. Good luck!!! This looks so amazing!! I’m drooling..I love the thickness of the pizza. I will definitely try this soon!! You can do it! Don’t be afraid. It’s really not scary, especially if you use instant yeast (look for the little jar that’s labeled bread machine yeast). It’s practically fool proof! You don’t have to bloom it in lukewarm water or anything — it’s totally do-able. Come back and let me know how it goes! That pizza looks nice and thick and so good! Quick question. I want to try a version of this recipe in the grill this weekend, but I’m a little confused with the chicken and the crock pot. Do you have to add water or anything in the morning? I’ve never used the crock pot without some sort of liquid, and I don’t want the chicken to burn!